This past Sunday was Easter Sunday when we celebrate our Lord’s Resurrection. The truth is that every day of every year, we can celebrate the fact that our Savior not only died on the cross for our sins, but rose again and is alive today! Today is the birthday of Lauren Michelle Kelly. I would like to thank all of my friends on the Xanga and WordPress blogs who prayed for her. Today she is spending her first Birthday in Heaven with her Lord. 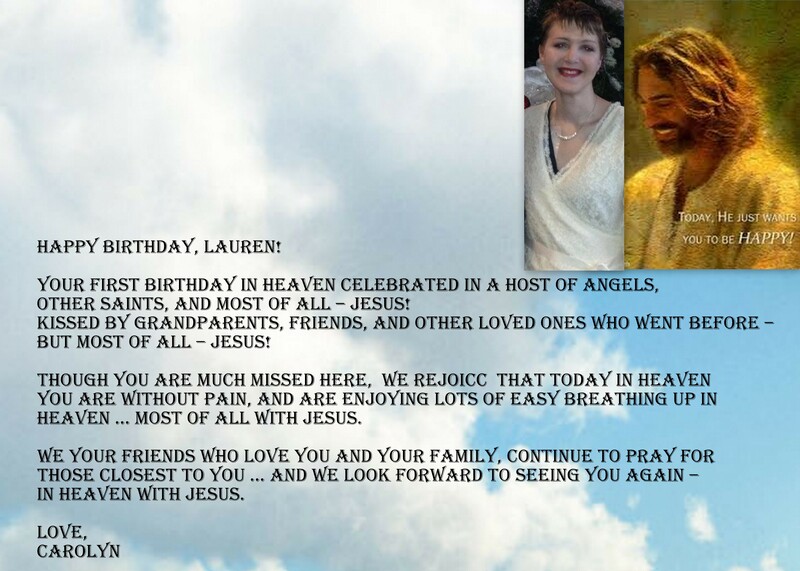 The following is the obituary that appeared in the local paper… and after that is the birthday remembrance card that I made and put up on her FB site. Please remember her family in your prayers. Just after midnight on Thursday, March 26, 2015, heaven’s gates opened for a very special angel, Lauren Michelle Kelly. At her bedside to say good-bye were her parents, Loren David Kelly and Debbie Lynn Kelly, her brothers Steven (Jennifer), Jared Brooks, and her sisters, Tracie Eilerman (Mike), and Mary Beth Pagano (Matt). Lauren was born on April 8, 1991, with a devastating genetic disease, cystic fibrosis (CF). 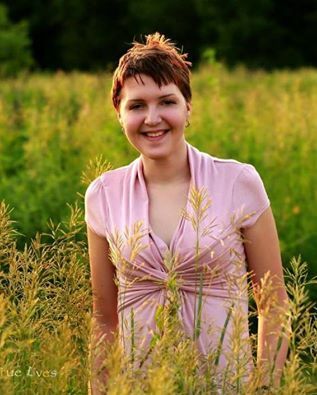 In spite of her serious health condition, Lauren accomplished many things in her brief 23 years. She played softball and was the Red Birds 1999 Batting Champion. She had a short stint playing soccer, but had breathing difficulties due to all the running. She participated in gymnastics and dance through Showtime Productions. Her greatest passion, though, was riding and showing paint horses. In the summer of 2010, she was named the winner of the American Junior Paint Horse Association Youth Member of the Year. She won a Gist belt buckle and a $1,000 scholarship. She did not start showing horses until she was 13. She had allergies and due to her respiratory constraints, she was told that it was not wise to be around horses. Lauren’s life mission was to make sure no one would look at her and say, “Yeah, that girl has CF.” To her, riding symbolized freedom and victory. Lauren ran her own graphic design business, LMKdesign.org, which she founded when she was 13 years old. Many of her ads were featured in equine magazines. She was a finalist in novice youth HUS at the APHA Youth World Show in 2008. Her last year in youth, she and Chaps (Sheik Sock Broker) were #5 in the nation in Youth 14-18 HUS. As her health deteriorated, she focused on academics. She graduated from the Dental Hygiene Program at Lewis and Clark Community College in December 2014 and was President of her class. She passed both her clinical and written board exams. She was a peer mentor to many students through both the Dental Assisting Program and the Dental Hygiene Program. Her motto has always been to say, ‘I can do anything I set my mind to.’ She believed the only real barriers in life are ones that you put up for yourself. How high you have to climb to get over those barriers differs, butLauren believed it could be done. Sadly, cystic fibrosis provided an insurmountable barrier and Lauren’s lungs failed before she could receive a lung transplant. Lauren was passionate about being an organ donor. Her final gift was the gift of her kidneys. She was loved and will be remembered by family and friends throughout the United States. She has named her memorial as Cystic Fibrosis Foundation (Gateway Chapter) for whom she did graphics work.